5. ...Into the abyss of Idiocy?! Joe is your average college kid on spring break, just wanting to take a camping trip with his friend Homer. They are camping out in the continental divide, Homer’s first experience with camping and Joe being the good buddy that he is teasing him to no end. Late at night Joe is off near the lake watching the stars when unexpectedly an alien ship crashes into the water. Frank and Fred soon have their first encounter with an Earthling. After accidentally getting stuck on Frank and Fred’s ship and launching into space, Joe finds himself in the middle of a jewel heist, and some intergalactic espionage, as well as at the center of a planets battle for freedom from two other world’s disturbance. It was a busy week for Joe and his most eventful spring break ever. JOE Just and Ordinary Earthling is a comical and unique twist to the alien abduction plot. The aliens are so human like in their behavior it is relatable to the reader. The subplot of Homer being lost in the woods and thinking he is going to die is comical and provides a reminder that Joe is off in space with aliens. While the book starts out on Earth and then moves to the planet Ladascus, it is hard to remember sometimes you are not on Earth. There is a very familiar and at home feeling to the setting and even the characters, that while the authors tell you they are not human, they definitely feel human in their personalities and mannerisms. The town most of the story takes place in is called Ngorongoro. It has a mix of low tech and high tech devices, including part of the population being androids that are made to emulate human minds and appearances. They can even have addiction problems, what are they addicted to? 9 Volt batteries from Earth of all things. The novel has quit a bit of humor such as this sprinkled throughout, like the Ladascus Zoo, it has four humans on display. This creates an awkward moment for all parties involved. The story line of the diamond heist introduces us to Ralph (not her real name) and how the miss scheduled job interferes with an intergalactic spy ring’s operations. This side story is reminiscent of the old spy movies. There are highly sophisticated and complicated spy nets and agents. One famous agent is Evinrude for the Quesonte. He outsmarts the others and always seems to be in the right place at the right time. 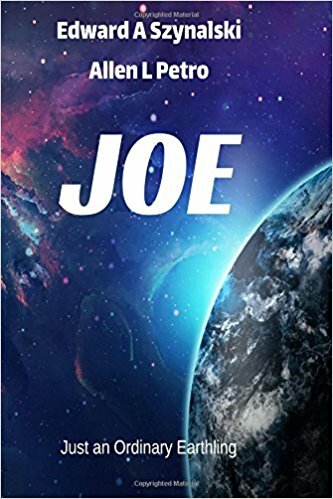 Joe Just an Ordinary Earthling Copyright © 2003,2017,2018 by edward a szynalski. All Rights Reserved.